The least exciting aspect of an interim update is the unchanging product design. Apple's MacBook Pro is no different than last year's model in terms of aesthetics, but we still appreciate the slimmed-down form factor and solid unibody chassis descended from the 2008 model. 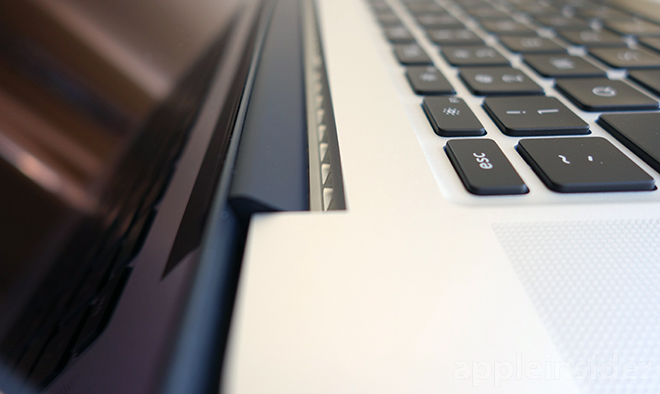 By removing the optical drive and rearranging the Pro's guts, Apple was able to bring down the laptop's height to only 0.71 inches, or 1.8 centimeters, and weight down to 4.46 pounds. One of the compromises with any thin notebook is its keyboard. 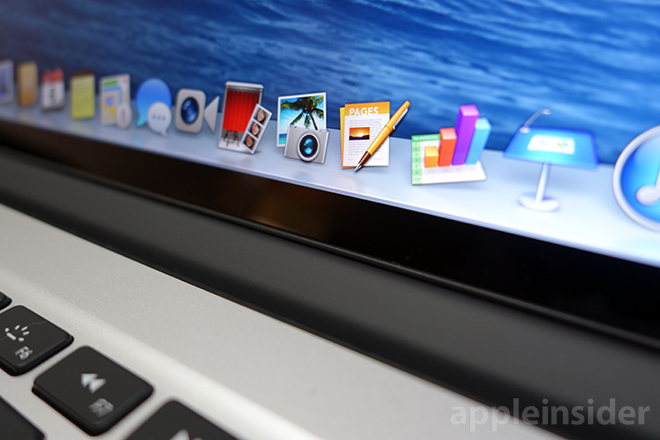 Apple's scissor switch keys are known for having decent stroke distance and tactile feedback, and the 2014 MacBook Pro is no different. For us, it's not going to beat the "clickety-clack" of a mechanical keyboard, but the well-designed hardware offers a great, non-fatiguing typing experience. Apple's proprietary MagSafe 2 makes a return without any noticeable changes, which is disappointing given the magnetized plug is prone to disconnecting at the slightest touch. Designed to quickly free itself in case someone trips over the charging cable or otherwise jostles the cord, MagSafe 2 is far too sensitive. As a safety feature, it works perhaps a little too well and we find ourselves constantly checking to make sure it's still attached. 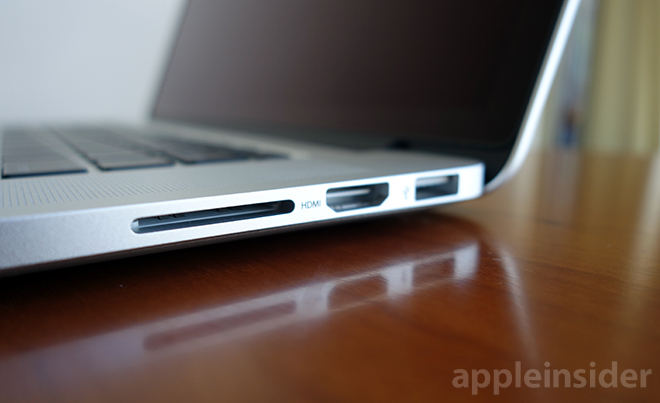 Input/output components remain the same, with two Thunderbolt 2 inputs, a USB 3.0 port and headphone jack on the left, and a USB 3.0 port, HDMI and SDXC card slot on the right. Two microphones hidden under the left speaker grille use beamforming technology for adaptive noise canceling, while the familiar glass multitouch trackpad sits front and center. 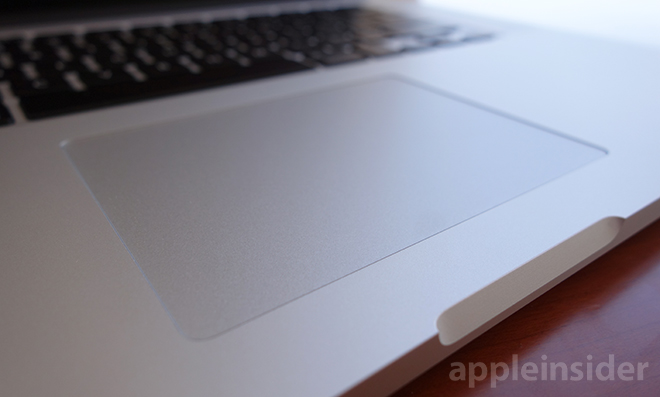 Apple offers a number of purchasing options for its MacBook Pro lineup, the most notable being a discrete graphics processing unit made by NVIDIA, a feature unique to the 15-inch variant. 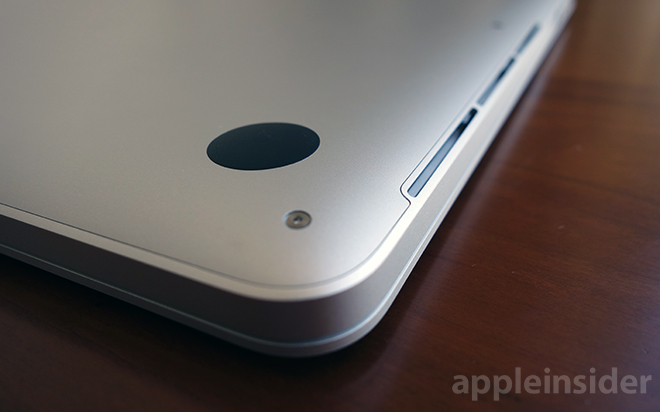 The base model relies on Intel's Iris Pro Graphics setup, which hasn't changed from 2013. For testing purposes, we went with the entry-level discrete GPU version that comes with a 2.5GHz quad-core Intel Core i7 CPU, 16GB of RAM and 512GB SSD standard. Additional options for this specific model include a 2.8GHz Intel Core i7 quad-core processor for an extra $200 and 1TB of flash storage for $500. The base model 15-inch MacBook Pro with Intel's integrated Iris Pro Graphics comes in at $1,999 and sports a 2.2GHz quad-core Intel Core i7 CPU, 16GB of RAM and a 256GB SSD. Customers can upgrade the CPU to either a 2.5GHz or 2.8GHz Core i7 processor and select from 512GB and 1TB SSD storage options. For our tests, we compared the latest MacBook against a maxed-out late-2013 model running a 2.6GHz quad-core Intel Core i7 CPU, 16GB of RAM and 500GB of flash storage. Original retail price was $2,799. 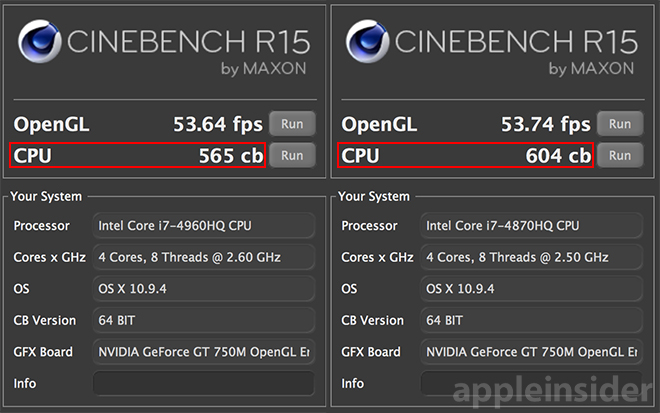 Cinebench results for Apple's mid-2014 15" MacBook Pro (left) versus a late-2013 model. 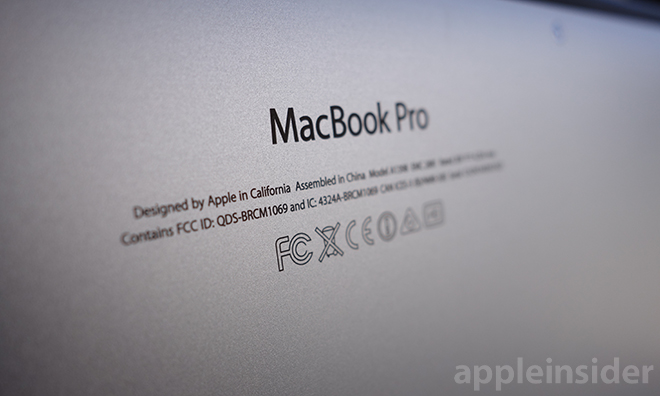 The new Pro packs in Intel's 2.5GHz Core i7-4870HQ processor, which first launched in the third quarter of 2014. Despite being clocked 100MHz below the 2.6GHz Core i7-4960HQ installed in Apple's late-2013 MacBook Pro, the new chip manages to keep pace in benchmark testing. As seen above, the newer 47-Watt CPU achieves a considerably higher Cinebench score than last year's machine and also wins in a multi-core 32-bit Geekbench 3 shootout. A slightly lower single-core performance is to be expected given the 100MHz clock speed difference. The new Pro sports Nvidia's GeForce GT 750M chipset, but with a newer ROM revision that maximizes throughput. In Unigine's Heaven benchmark, both laptops run dead even on average, but the late-2014 model pushed at least 19.5 frames per second and managed a high of 53.7 FPS. While not the best results we've seen (the Mac Pro easily doubles the MacBook Pro's numbers), the outcome is quite good for a portable. Mid-2014 15-inch MacBook Pro (left) versus late-2013 model. Flash storage is also a carryover from last year. The PCIe-based SSDs read at the same 720-megabytes per second clip on Blackmagic Design's speed test, but the new Pro beats on write times, hitting a maximum of 726 MB/s. Since the hardware and controller are virtually the same, we chalk the difference up to 300GB worth of documents and drive degradation from nine months of daily read/write operations. Moving away from benchmark figures, we found little to no difference in performance when running intensive tasks like batch processing images in Adobe Lightroom or editing high-definition movies in Final Cut Pro. The same goes for menial tasks like spreadsheet number crunching and streaming movies from YouTube and Netflix. As usual, the Retina display brings stunning 2,880-by-1,800-pixel pictures to life with great viewing angles and consistent color accuracy. While Apple sources screens from various manufacturers, both 2013 and 2014 versions we tested happened to have identical "LSN154YL01-A01" Samsung panels. LG is also a Retina screen supplier, and while some users have reported slight color tone inaccuracies and image retention from both vendors, neither of our test machines suffered from such issues. Apple claims up to eight hours of battery life per charge, but we were only able to eke out around six hours under normal operating conditions (Internet usage over Wi-Fi 802.11ac, text editing, light photo editing, display brightness set to 50 percent). Streaming a 1080p video from YouTube with display backlight cranked to maximum yielded a bit more than 4 hours of up time. With a high-resolution screen and discrete GPU, the MacBook Pro can easily be considered a desktop replacement, but we would definitely like to see enhanced on-the-go operating time, especially for a device used by professionals. A longer-lasting Pro may not require a hardware revision, however, as the forthcoming OS X 10.10 Yosemite includes a few power-saving features like HTML5 Premium Video for Safari. The new MacBook Pro is not a groundbreaking computer, but it's not meant to be. Incremental changes keep hardware fresh and give customers the chance to take advantage of lower component costs. With performance comparable to last year's halo 15-inch MacBook Pro at a cheaper price point, the late-2014 base model with discrete GPU is an easy recommendation for new buyers. Without any major aesthetic changes or meaningful battery life improvements, however, owners who purchased their MacBook Pro within the past two product cycles are likely better off skipping this update. Overall, the mid-2014 15-inch MacBook Pro is a solid, if not revolutionary, update to Apple's lineup that sets a high bar for next year's refresh. 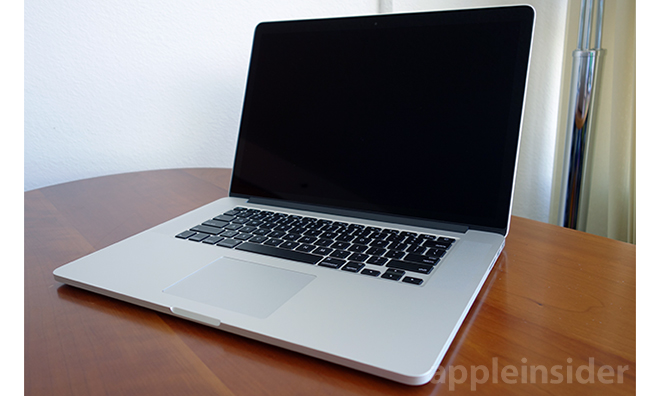 Readers in the market for a mid-2014 MacBook Pro can head over to our Price Guides for the lowest possible prices. Through partnerships with some of Apple's largest Authorized Resellers, AppleInsider is proud to offer the industry's best pricing on MacBook Pros, MacBook Airs, and virtually all other Apple products. As of press time, several Apple Authorized resellers are selling the $2,499 high-end 15" MacBook Pro retail configuration we tested (model no. MGXC2LL/A) for $2,374.99, including B&H Photo, which throws in your choice of either a free copy of Parallel's Desktop for Mac or a 1-year subscription to LoJack for Laptops. You can also save another $105 by bundling a discounted 3-Year AppleCare Extended Protection Plan with this Mac by selecting it from the "Protections Plans" drop down menu on B&H's website. The two together price out to $2,618.99 —a savings of $229 off Apple's price for the Mac + AppleCare bundle, and the lowest price for this particular MacBook Pro with AppleCare anywhere by $34, according to our Macs + AppleCare Price Guide. And as long as you do not live in NY state, B&H also won't collect any sales tax on your order, which will add roughly another $200+ in tax savings for a combined discount of over $430. Similar discounts are available dozens of other MacBook Pros with AppleCare that are listed from B&H in our Macs + AppleCare Price Guide (portion of which is also below). For readers looking for absolute lowest price on just the MacBook Pro itself, MacMall also lists this model for $2,374.99 but offers AppleInsider readers an additional 3% off its MacBook Pro and MacBook Air prices when using the links in the Price Guides and then applying promo / coupon code APPLEINSIDER01. This drops the price to $2,303.74 —$195 off Apple's retail price and the lowest price anywhere for this model. MacMall also only collects sales tax if you're shipping your order to CA, CO, GA, IL, MN, NC, NY, TN, or WI. Another cost saving option is to consider a handful of closeout specials on the 2013 MacBook Pros that remain in Apple's sales channel, given that these models are nearly identical in architecture and performance to the models released in 2014. For additional offers, models and tax-saving options, check out or Price Guide inserts below or jump over to the full Price Guides. Also, if you're planning to upgrade but don't have a plan for your existing MacBook, consider selling it to one of the top-tier buyback services for some cash, which you can then use to offset the cost of your new MacBook Pro.